Is this Swiss? 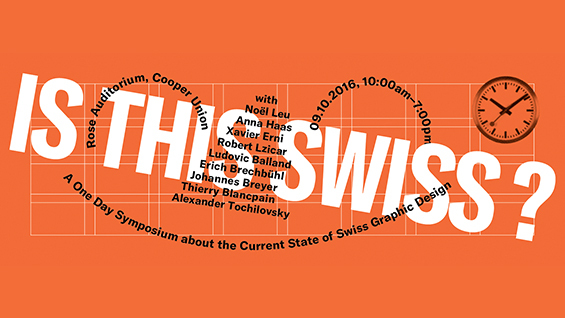 is a free, one-day event devoted to graphic design from Switzerland, with talks, panels and a guided tour of the exhibition “Swiss Style Now” at 41 Cooper Gallery. It discusses what characteristics link the exhibited works, as well as if and how today's designers deal with the legacy of the Swiss Style. To examine these questions, five award-winning graphic designers and typographers from Switzerland present their work with a focus on national characteristics and the role of history in their professional practice. Two additional talks focus on the theoretical and historical background of the symposium, deriving from current research in the field of graphic design history. Afterwards, a guided tour of the exhibition by the curators gives participants an opportunity to see concrete examples of works by the speakers, and learn more about the curation process. The symposium ends with a panel discussion, reflecting the insights of the day and setting the ground for future debated questions on the subject, followed by an “Apéro” – a traditional Swiss drinks reception – for informal exchange. The symposium is kindly supported by the Consulate General of Switzerland in New York and swissnex.